Ada is located in the Dangme East District, some 120 km East of Accra. 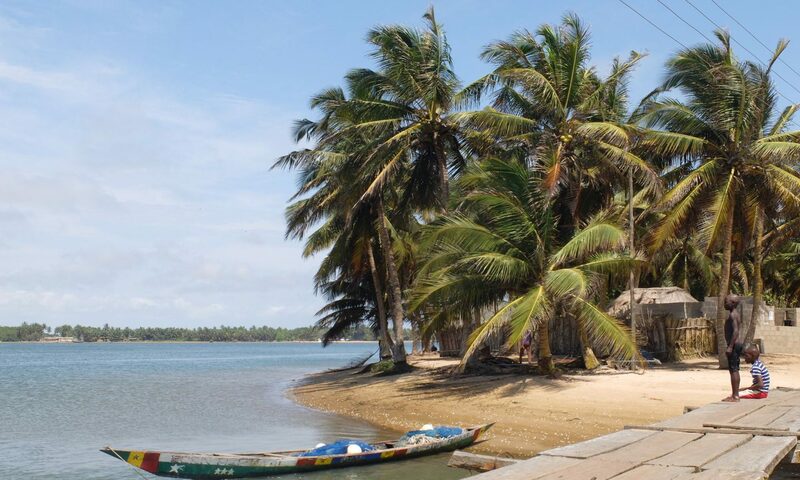 Ada actually consists of three towns: Kasseh, Big Ada and Ada Foah, the latter one located directly at the beach where most tourist attractions can be found. About 120.000 people live in the district, most make their living with fishing, subsistence agriculture and animal rearing. Apart from the ocean, river and lagoon, the great amount of coconut trees, introduced by the Indonesians, make up the image of the region. As legend has it, the Ada people originally migrated from Sudan, migrating through Benin and Nigeria, passed the Shai hills to finally arrive at their current location. Their first settlement, the Okor forest, also has a spiritual significance. The district capital, Ada Foah, was originally called Ada Fort because of having a trading fort at its seaside. In the 18th and 19th century, when the Danes were the main trading partners of the people of Ada, the town used to be an important harbour and trading center. Hardly any traces remain from Ada’s former glory; most of the old buildings have been washed into the sea but part of the fort remains at the seaside and can be visited. During this time, Ada also became a major market for slave trade. Although the Ada people never captured people to sell them, they acted as middlemen between African slave sellers and European slave buyers.